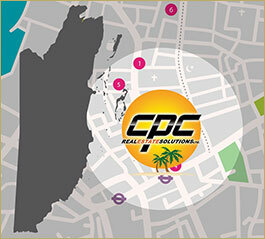 Belize City - CPC Real Estate Solutions Ltd. In an effort to please our clients in any part of Belize, CPC Real Estate Solutions Ltd. has offices all over the country. When looking for real estate in Belize City, make our Belize City office your first stop! Turn Right onto to Albert Hoy Ave. Turn Left onto Albert Hoy Ave. Turn Right onto Will & Sharper St.